If you've forgotten your password or would like to change it for any reason, please follow the instructions below. 1. In order to reset your password, use the "I Forgot My Password!" 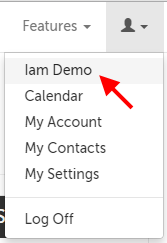 button on the login page. 2. Enter the e-mail address associated with your account, and click the Reset Password button in the lower left-hand corner. 3. You should receive an e-mail with a link to reset your password. 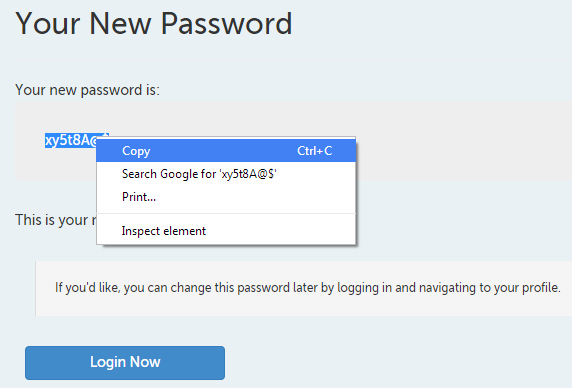 Copy your new password from this page, and then use the "Login Now" button. 2. Click on the profile icon in the upper right hand corner and select your name from the menu. 3. Use the "Change Password" button in the lower left hand corner. 4. Use the "Save" button. There will be a confirmation message along the top if your changes are saved. This article was last reviewed by our Support team on December 29, 2014.